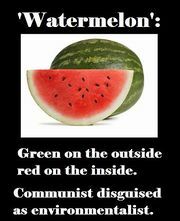 This is a faux environmentalist, someone green on the outside, but red (communist/socialist) on the inside. Environmentalism might seem to be their cause, as they champion everything that's anti-humanity and pro-authority. But authoritarian regimes are their true passion. Some aren't self-aware enough to realize that they are watermelons: Vladimir Lenin and the USSR used to call those people "useful idiots" - non-communists regarded as susceptible to communist propaganda and manipulation. This page was last edited on 3 February 2019, at 14:13.